by Adriana Trigiani | Literature & Fiction | This book has not been rated. From the back cover: "It is 1950 in glittering, vibrant New York City. Lucia Sartori is the beautiful twenty-five-year-old daughter of a prosperous Italian grocer in Greenwich Village. The post-war boom is ripe with opportunities for talented girls with ambition, and Lucia becomes an apprentice to an up-and-coming designer at chic B. Altman department store on Fifth Avenue. Engaged to her childhood sweetheart, the steadfast Dante DeMartino, Lucia is torn when she meets a handsome stranger who promises a life of uptown luxury that career girls like her only read about in the society pages. 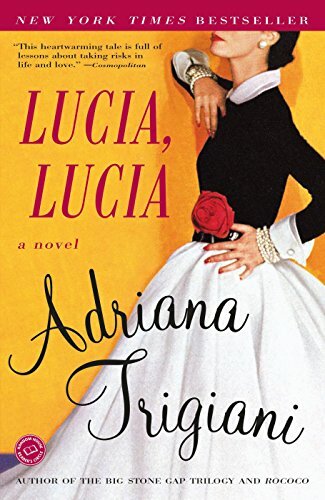 Forced to choose between duty to her family and her own dreams, Lucia finds herself in the midst of a sizzling scandal in which secrets are revealed, her beloved career is jeopardized, and the Sartori's honor is tested." I liked this very moving story of an Italian-American girl living in New York in the fifties. It is a thought-provoking look at the cultural values of the time and how they influenced Lucia and her family. This book is now on its way to klaradyn, who chose it out of my Two Worlds Virtual Bookbox. Enjoy! Arrived today. Thanks so much, loveamystery! I look forward to reading this one. I loved this book, and especially enjoyed reading about the changing world of fashion and style during this time period. I have another Trigiani book TBR, and really hope it has a happier ending than the two I've already read! On the way to jneni in Singapore, who will release the book on her visit to China. My book # 34 for guinvave's Keep Them Moving challenge.